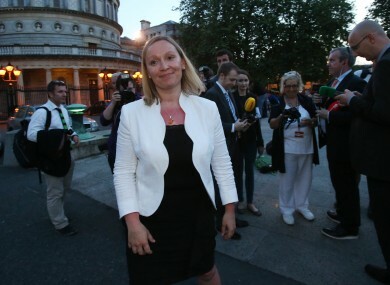 LUCINDA CREIGHTON AND other members of the newly-formed Reform Alliance will be allowed speaking time in the Dáil when it returns from recess tomorrow. The former Fine Gael junior minister said she was “very grateful” to the Ceann Comhairle for facilitating those “exiled” from their parliamentary parties with “some vital Dáil speaking time”. Dáil Ceann Comhairle Seán Barrett informed the 12 TDs who have lost either the Fine Gael or Labour party whip since taking office in 2011 that they would be granted some speaking time on government business. Usually, the rotation of Dáil speakers includes only government members, Fianna Fáil, Sinn Féin and the Technical Group. A note from Barrett’s office informed the deputies – including the five Dáil members of the RA and former Labour members Colm Keaveny and Róisín Shortall – that “some speaking slots for ‘others’ will be incorporated in the rotation” from tomorrow on. The ‘others’ slots are intended for use by members who do not have access to the speakers lists prepared by the parties or the Technical Group. The number of ‘others’ slots will be calculated proportionately, based on the overall numbers of members. Members wishing to avail of a portion of the time allowed will be obliged to indicate their intentions to the chair. The surprise move is solely the work of the Ceann Comhairle. It comes in the wake of reported disagreements between his office and government over a lack of consultation on Dáil reform proposals announced last week and a row over the appointment of a new clerk of Dáil Éireann to succeed to the retired Kieran Coughlan. Chief Whip Paul Kehoe was not aware of the decision confirmed tonight. He told TheJournal.ie that he had not yet seen the email correspondence and so could not comment. The so-called rebels will not be allowed participate in Leaders’ Questions or be given Private Members’ Time, where they could propose their own bills and motions. Email “'Exiled' party members granted speaking rights in Dáil”. Feedback on “'Exiled' party members granted speaking rights in Dáil”.